For those of you on the hunt for fabulous letterpress invitations for your wedding or event or just great stationery (letterpress baby announcements, perhaps?) 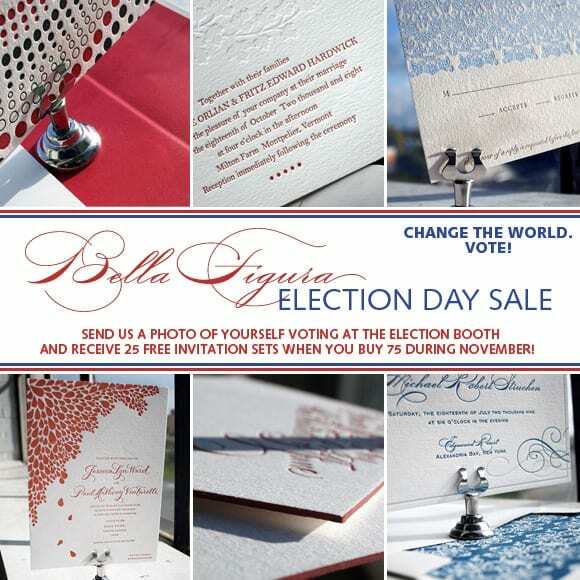 make sure to check out the Bella Figura Election Day Sale! Now, I have to admit to being completely biased (as I work for Bella Figura), but I’m not lying when I say that Bella Figura letterpress is unrivaled in quality. The paper, the designs, the impression, the ink. It’s enough to leave your guests speechless when your invitation hits their mailbox. I literally spend hours every day marveling over the beautiful pieces coming off the press. (It’s a pretty cool gig, admittedly.) Lucky for you, Bella Figura is offering 25 free invitation sets when you order 75 sets on orders placed in November. The catch? You have to get out and vote tomorrow and email a photo of yourself voting to [email protected]. The more creative and fun your photo the better as the Bella Figura in-residence blogger (that’d be me, by the way) will be featuring photos of Bella Figura customers caught in the act of voting next month on the Bella Figura blog. If you’re going to be a first time voter tomorrow, here is your extra incentive to get out there and help change the world. Vote!